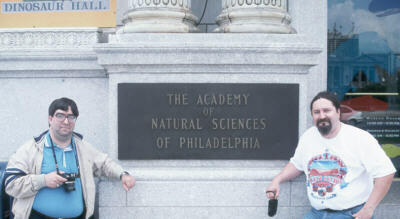 Jon and I outside The Academy of Natural Sciences in Philadelphia of Drexel University, PA (photo by Don Frack). 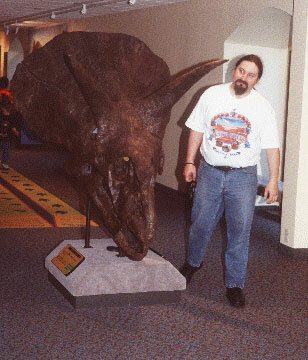 While looking through some old photographs, for something else I am working on, I came across some snap shots I took back in 1998 when my friend Don Frack and myself flew back to the East coast to attend the DinoFest 98 symposium (a combination dinosaur fossil exhibition and gathering of dinosaur paleontologists) in Philadelphia, PA.
A Triceratops skull and myself at The Academy of Natural Sciences, in Philadelphia, PA (photo by Jon Woolf). return to Philadelphia and attend the three day symposium, after which Don and I would drive down to Washington D.C., go to the Smithsonian National Museum of Natural History and fly home from there. It was at once a fun, fascinating and frustrating trip, which I won’t get too much into now. Let’s just say the both of us a life-long Californians experienced a combination of a bit of culture and geography shock. 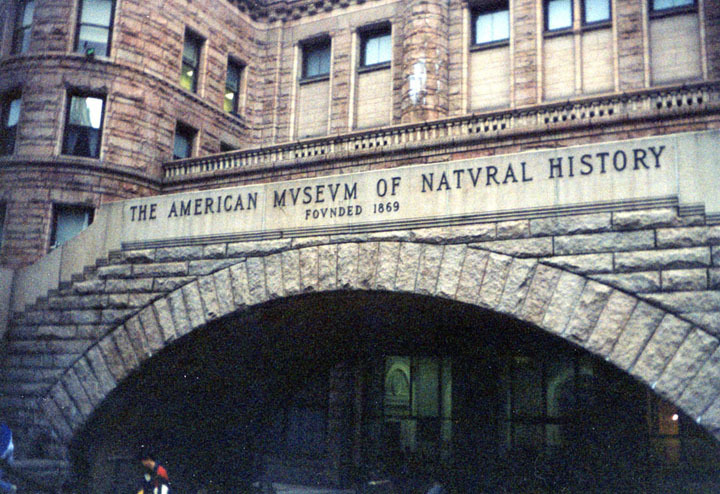 Anyway, since we were going to go to the American Museum, Don thought he might contact a couple of the scientists who worked there to see if we could go behind the scenes and get a closer look at some of the material in their collection. In this case material that is of particular interest to those of us involved in the creation/evolution debate, namely their casts of the original “Peking Man” (a.k.a. Sinanthropus pekinensis but now recognized as Homo erectus) material. 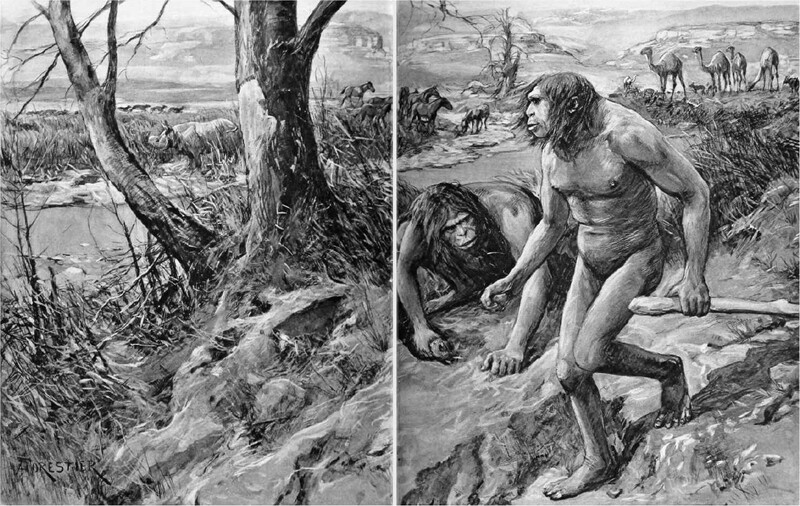 The fossils represented a number of individual H. erectus‘, unearthed in China at a site known as Zhoukoudian (or Choukoutien) near Beijing in the late 1920’s and early 30’s. …and detailed descriptions, measurements and photographs (in both visible light and X-rays). Then there was the additional H. erectus material found at the same site, but who cares about the facts? In any case, it is a fascinating story, and I will link to some articles on the interwebs and provide a couple references at the bottom of the page for anyone interested in looking into more deeply into it. So, the paleoanthropologist in charge of the material (unfortunately I can’t recall his name) agreed to allow us to examine and photograph the Peking Man casts (and a few other surprises). The side (?) entrance (exit?) of the American Museum. This is actually were we exited the museum. We entered through the main entrance across the street from Central Park. 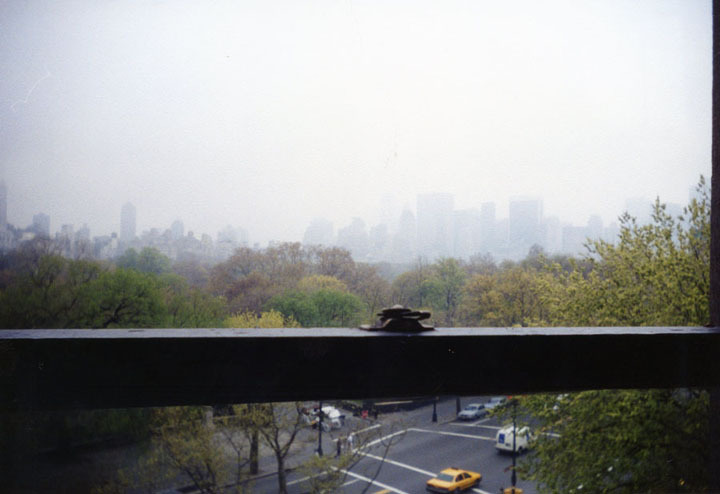 Looking out one of the AMNH windows onto Central Park. The city was socked in with fog all day and into the evening when we left, so despite having being to middle of Manhattan I never really saw any of its sky scrapers. All the taller buildings just disappeared into the low hanging clouds after about ten stories. I think we even drove right by the World Trade Center on our way out but never saw it. 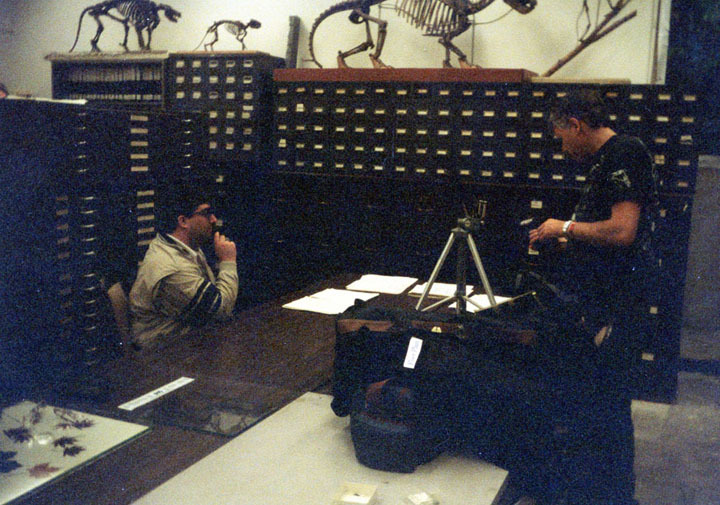 My friends Jon Woolf (left) and Don Frack (right) waiting to see some of the material at the AMNH. 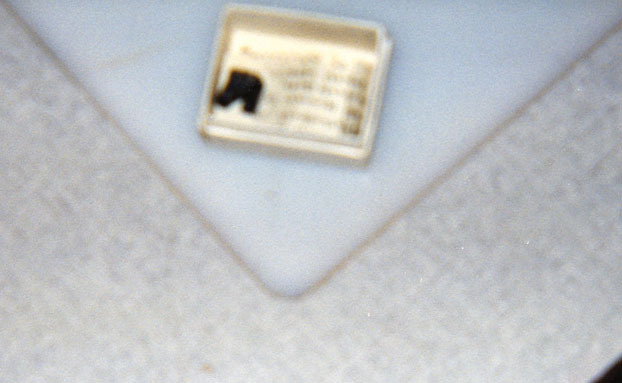 Now that I think of it, this shot was actually in the mammalian paleontology collection (not paleoanthropology), where we saw one fossil tooth. I will get back to that later. 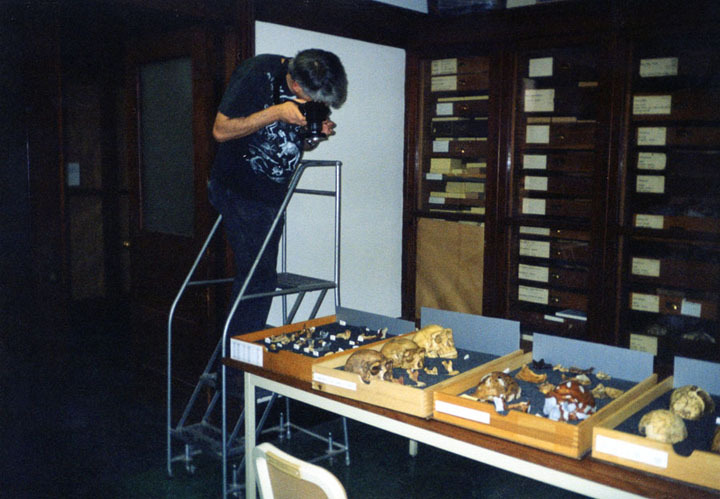 Don, doing what Don does, taking lots of pictures, in this case of casts of the Peking Man fossils. Jon with several drawers of casts. One of the drawers containing casts of the Peking Man material. Two reconstructions of Peking Man, old and new. 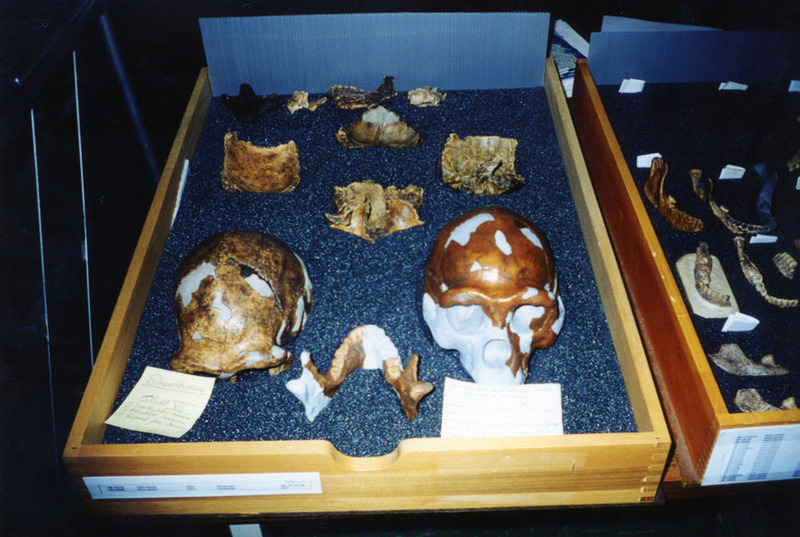 The reconstructed skull on the left is the one produced by Franz Weidenreich and Lucille Swan back in 1937. Weidenreich took over the management of the Peking Man fossils (and fossil site) after their original describer, Davidson Black, died suddenly in 1934. The newer reconstruction on the right is by G. J. Sawyer and Ian Tattersall. Both reconstructions are composites that include material from multiple individuals (Tattersall & Sawyer, 1996). They are still nowhere near a monkey, something that anyone who had bothered to compare them to other known fossils of H. erectus would be able to discern easily. 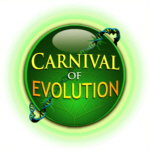 Creationists, apparently, didn’t bother (at least not until recently*). If they had the worst they could have argued, with regards to the Peking Man casts, was that they represented examples of fraudulent H. erectus fossils; and where would the sense be in that? 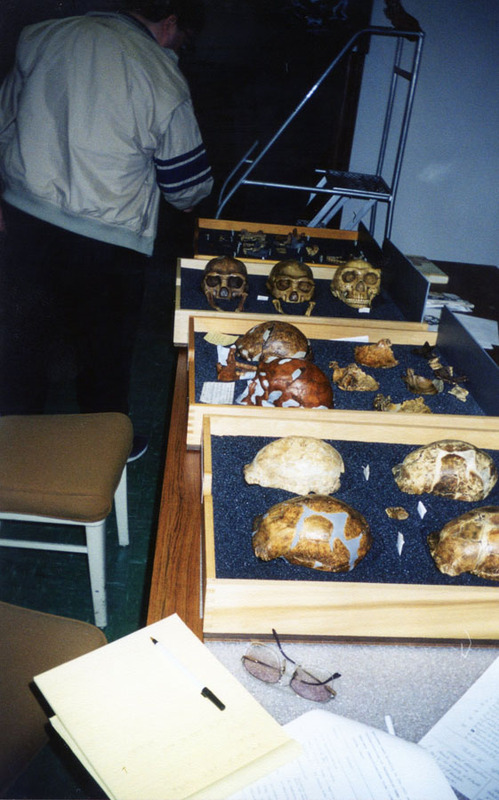 Another bit of fun that happened while we were checking out the Peking Man casts was when one of out hosts offered to bring out the AMNH cast of the infamous Eoanthropus dawsoni, a.k.a: “Piltdown Man“. A cast of the “Piltdown Man” material in the collection of the AMNH. The fraudulent Piltdown Man material was “discovered” (or likely created) by amateur archaeologist Charles Dawson in 1912, was actually part of a modern human skull and the lower jaw of an orangutan, colored and otherwise modified to appear as if it might belong to a pre-human species. It was uncovered as a fraud in the 1950’s and has been used as a weapon by creationists ever since to try and cast doubt on pretty much all fossil material belonging to human ancestors. This brings us back to the third picture above (the one with Jon and Don in it), that was taken in the fossil mammal dept., where we were waiting to see a fossil peccary tooth. However this was no ordinary peccary tooth, this was the peccary tooth that was infamously misidentified by paleontologist Henry Fairfield Osborn as a primate tooth and popularly called “Nebraska Man“. My blurry P.O.S. picture of the infamous “Nebraska Man” took in the collection of the AMNH. 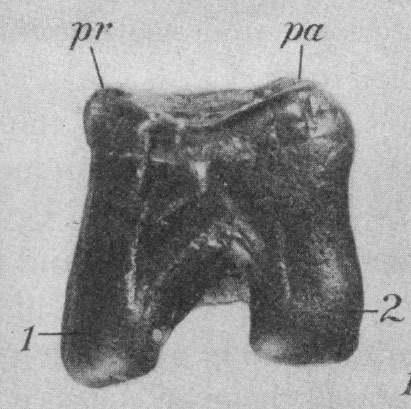 Found in Nebraska by Harold Cook (rancher/geologist) in 1917, the tooth was dubbed Hesperopithecus haroldcookii (the generic name literally means “Western-ape”), after its discoverer, in 1922 by Osborn who thought it might belong to a primate. The mistake was corrected in 1927 when a retraction was printed in the journal Science announcing that the tooth probably belonged to a peccary (a type of pig) rather than a primate (Gregory, 1927). 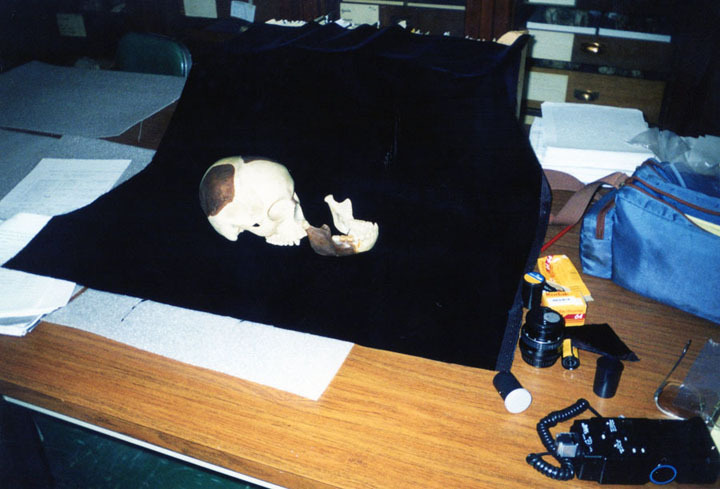 Like the “Piltdown Man” fraud, the “Nebraska Man” mistake has been used by countless creationists since (and almost always illustrated by this one picture) to try and discredit all paleoanthropological finds. Ever since our trip to the American Museum I have been able to say that I have held the Nebraska Man tooth in my own hands and examined it personally. 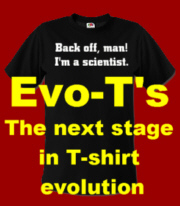 So anyway, this wasn’t meant as some new devastating critique of creationist arguments, this stuff has already been long and ably refuted (see links below), so I won’t be submitting it to my new Patreon account but I figured some might find the pics and my story interesting. 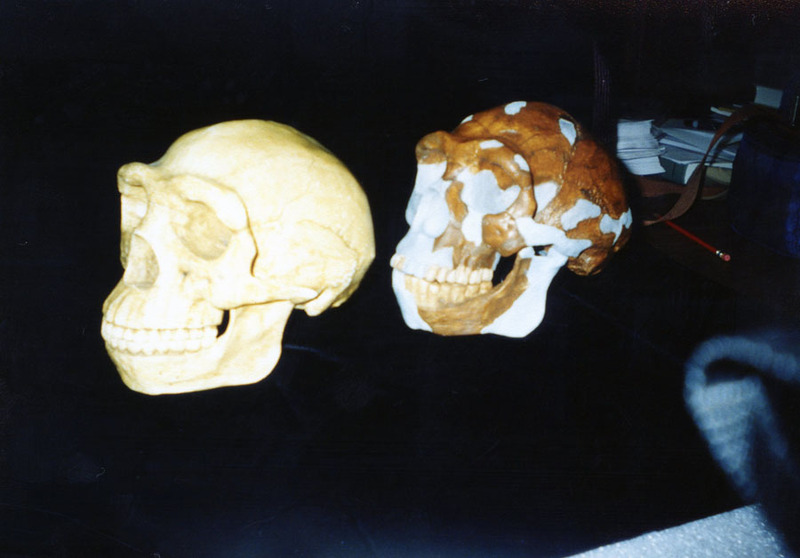 * After many decades of most prominent creationists arguing that many of the famous examples of Homo erectus were the remains of either large gibbons (“Java Man”) or monkeys (“Peking Man”), in the 1990’s some creationists switched to arguing that these and other H. erectus fossils were really just the remains of Homo sapiens variants (Lubenow, 1992)(Mehlert 1994). So depending on which creationist you ask H. erectus is either just a monkey/ape, or it is just a variation of a modern human. The one thing they all do seem to agree on is that H. erectus is not an intermediate form between earlier hominins and modern humans. Official web page of the Zhoukoudian Site Museum (English version). Piltdown Man: The Bogus Bones Caper (Talk Origins Archive), this includes numerous links to more on Piltdown Man. Gregory William K. (1927) “Hesperopithecus apparently not an ape nor a man“, Science, 66:579-81. This entry was posted in Creationism, History of Science, Paleoanthropology, Personal and tagged American Museum of Natural History, Creationism, DinoFest II, Eoanthropus, Hesperopithecus, Homo erectus, Nebraska Man, New York, paleoanthropology, Peking Man, Piltdown Man, Sinanthropus pekinensis. Bookmark the permalink.